We've been mastering the art of kitchen design since 1989. Follow our blog to catch up on Before & After shots, design & remodeling ideas, and trending kitchen designs. Finding a local cabinet maker for those perfect kitchen cabinets in Colorado Springs for your home can be tough. That’s because there are so many colors, styles, and designs available on the modern market. With kitchen décor choices and trends changing at such a fast rate, many homeowners are choosing to opt for more timeless kitchen cabinet styles when searching for "kitchen remodeling companies near me". By doing their research, they’re ensuring that they can create a kitchen that will be functional and in style for years to come. If you’re a homeowner in Colorado Springs uncertain of what timeless kitchen cabinet trend is right for you or what trends you should avoid then continue reading. Designing a kitchen with semi-custom kitchen cabinets can make your kitchen as unique as the Colorado Springs landscape. However, the variety of options available when choosing cabinets can be overwhelming. In this article, we will explain the three types of production methods used to make kitchen cabinets. This will help you narrow your choices to find the right fit for your home. From that early morning cup of coffee you sip as you gaze out at your view of Pikes Peak, to the warm holiday gatherings of friends and family on a cold winter night, the appliances you choose will add that finishing touch to your gorgeous kitchen remodel. The kitchen is the heart of the home where family and friends gather, no matter the time of year. As you design your kitchen remodel, don’t forget to budget for the right appliances for you and your family’s needs. After you’ve picked out the cabinets, countertops, and hardware, you won’t want to skimp on the appliances. The right appliances will ensure you enjoy your kitchen remodel for years to come. 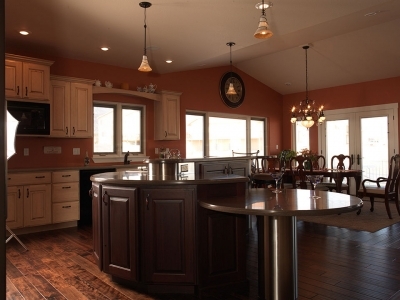 Are considering a kitchen remodel of your Colorado Springs area home? This article provides some helpful advice about budgeting for your major kitchen appliances. Did you know that you can have kitchen cabinets custom built to fit perfectly in your kitchen? Most Colorado Springs homeowners are unaware of just how easy it can be to buy kitchen cabinets that are custom cut and assembled to their exact measurements. This allows you to create your perfect kitchen layout. Remodeling or building a custom kitchen can be an exciting time for a family, but it can also be an overwhelming process. You have to pick flooring, paint colors and even appliances. Of everything, one of the most prominent parts of a kitchen redesign are the kitchen cabinets. These take up a huge part of the kitchen space, making them one of the most important decisions you’ll have. When picking your Colorado kitchen cabinets for your dream space, you have the option of stock cabinets or custom cabinets. Both options can make a lovely kitchen, but it’s important to look at the pros and cons of custom kitchen cabinets versus stock cabinets. A kitchen is a place of gathering and most often considered the heart of the home. It is a social center. You and your spouse might sit at the island and have coffee together in the morning, during parties it is where people always gravitate to grab a plate of food and chat about their lives, and most nights, it is where a family will make dinner together and talk about their day. A kitchen that fits your life is an important part of feeling comfortable in your home, specifically because you spend so much time there. If the kitchen is outdated or too small, you may find yourself avoiding this area of the house because it feels too crowded. Or maybe there are features you don’t like. You may be good at ignoring them but deep down you know it is time for a kitchen remodel. As a house flipper, the top priority is to deliver the highest quality home while still making a profit. But when the time comes to start renovating the property, it can be tough to decide which rooms will get the most attention. According to countless studies, including one conducted by HGTV, has suggested that kitchen remodels can return more than 100% ROI in hot housing markets. Not bad! Let’s review the specific kitchen features house flippers should prioritize during their a kitchen remodel. You want to love your kitchen remodel – not regret it! What would you do with a beautifully designed kitchen? For growing families, exciting birthday parties and heart-warming family dinners are probably just a few of the ideas that come to mind. But that’s not all a well-planned kitchen remodel can do. Because kitchen renovations offer one of the largest ROI’s compared to other home improvement projects, property owners looking to take advantage of the booming real estate and rental market in Colorado Springs can actually increase their home value with a well-designed cooking and dining area. Working with a certified interior design professional during your kitchen renovation can help you avoid common DIY remodeling mistakes. As the wise Edward Abbey once said, “Great art is never perfect; perfect art is never great.” We believe the same is true for interior design. But few homeowners take this advice when remodeling their kitchen. Thanks to the countless interior design websites like Houzz, it’s not uncommon to get carried away while planning the design for a kitchen upgrade. Instead of a quick and easy remodel, kitchen renovations often transform into lingering obsessions. Today, we’ll give you a few tips to fight design perfection – grab your notepad!